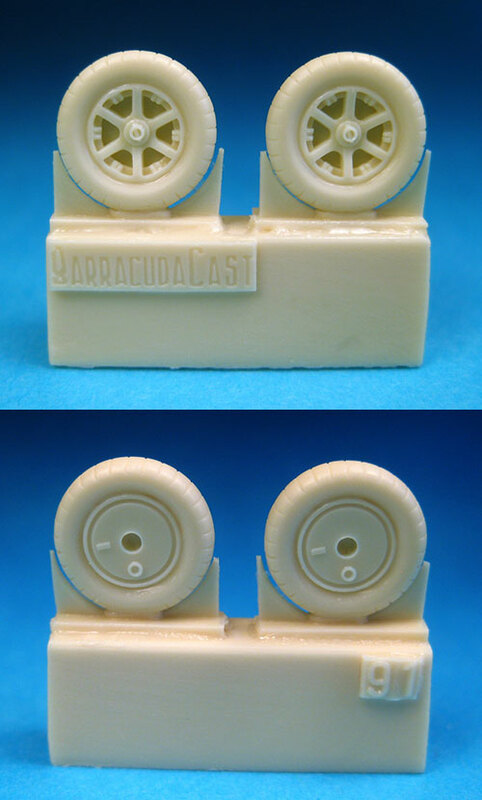 Barracuda Studios is proud to announce the release of 4 new 1/72nd scale and 2 new 1/48th scale products in the BarracudaCast resin detail set line. These sets are up on the website now and available for order. These new 1/72nd scale sets represent an expanding product line for builders of 1/72nd scale kits. More will follow in the next few months. For 1/48th scale builders of WWII Russian fighters, we present two sets that represent a fast and easy upgrade for a number of different aircraft. Here are the details. 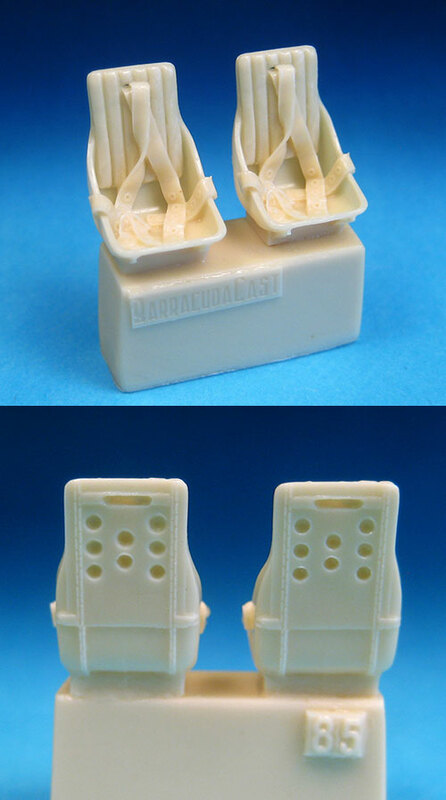 This set consists of two highly detailed, accurate resin seats with molded-in seat belts as fitted to the LaGG-3, La-5, La-5FN, I-16 (type 6 and earlier). Fits any 48th kit. Master patterns by Mike Good. 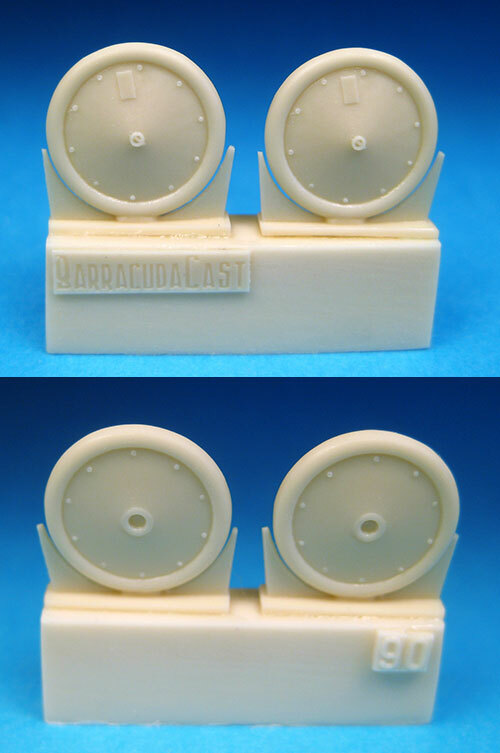 This set contains a pair of highly detailed, accurate resin mainwheels as fitted to the MiG-3, Yak-7, Yak-9, LaGG-3, La-5, La-5FN, La-7. Fits any 48th kit. Master patterns by Mike Good. This upgrade contains three seamless detailed resin prop blades and a detailed spinner with 12 blade cooling fan. Replaces inaccurate kit parts for the Tamiya Fw 190A-3, as well as the AZ, Zvezda, Airfix, and Academy 190A,F kits. Patterns by Roy Sutherland. This quick and easy upgrade contains accurate, detailed resin early style mainwheels and geardoors. Replaces the undersized mainwheels and thick doors on Tamiya’s A-3. Also for the AZ, Zvezda kits, as well as any Fw 190A-5 kit. Patterns by Roy Sutherland. This new set consists of one pair of super detailed resin wheels to replace the Eduard, Roden, Revell and Airfix kit wheels. For all Albatros variants, as well as the Pfalz D.III and D.IIIa. Patterns by Mike Good. Super detailed resin wheels with accurate tire tread in this set replace the Airfix, Tamiya, ICM, Academy, Hasegawa, and Hobby Boss Me 109B-E kit wheels . Will also work for all 109F and G-2 kits.